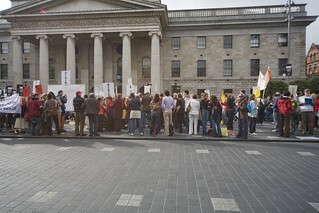 More than 200 people attended a protest on O'Connell Street in Dublin today to show solidarity with the Burmese people. The protest, organised by Burma Action Ireland, is being held in support of the Burmese people. Burma Action Ireland, who organised the protest, say they hope to maintain international pressure on Burma's military to end its violent regime. The Foreign Affairs Minister Dermot Ahern is to raise the Burma issue this week when he addresses the UN General Assembly. Security forces in Burma are reported to have used batons to suppress pro-democracy protesters. Several hundred people have taken to the streets of the main city, Ragoon. UN envoy Ibrahim Gambari flew into Burma today to try to persuade the government to use negotiations instead of guns to end mass protests. Troops and riot police manned barricades in the area from which the pro-democracy protests have reverberated around the world. Police fired warning shots to disperse 100 protesting youths. Small groups gathered today taunting the troops before scattering down alleys when they started to charge. In one incident, police fired warning shots to disperse 100 youths shouting slogans and waving bright red 'fighting peacock' flags. The government says it is acting with restraint. But that has meant firing at crowds, raiding Yangon monasteries thought to be at the vanguard of the protests, detaining hundreds of monks and sealing off two pagodas marking the start and end points of the mass protests. Senior Buddhist monks have reported six of their number killed since last Wednesday, and state-run media said 10 people had been killed since the crackdown began. Among the dead was a Japanese journalist, apparently killed at the hands of a soldier firing at point-blank range. But British Prime Minister Gordon Brown said yesterday he believed believe the loss of life is far greater than is being reported. The British Ambassador in Ragoon, Mark Canning, said he has witnessed several beatings. China, the Burmese government's main ally, publicly called for restraint for the first time last Thursday. But at the UN, China has ruled out supporting sanctions or a condemnation of the use of force. The US has banned dozens of members of Burma's military government from obtaining travel visas because of the ongoing violence. A State Department spokesman said more Burmese officials will be added to the list if they are judged to be responsible for human rights abuses. News of the ongoing protests and the regime's response has slowed as the government appeared to cut off internet and mobile phone communications.